I’m not a big fan of dried fruits, so I will admit that I know very little (beyond the taste) about dates which I usually see in the dried form. But reportedly dried fruits, like dates, are easily portable when you’re in a rush and may satisfy that sweet craving without having to resort to eating nutrient-void processed foods such as candy. Dates are sweet, very sweet! Some may even say dates are the sweetest fruit in the world. This fruit is a natural source of sugar called fructose. In fact, just one medjool date, a common variety of date said to have originated in Morocco, contains almost 16 grams of sugar. Are dates good for you, especially if you are diabetic? Well, it appears that if consumed in moderation and if you otherwise follow a healthy, balanced diet, dates are a sweet but healthy treat (even for diabetics). “If diagnosed, a diabetic can eat dried fruits [such as dates] for nutrients like fiber, minerals,vitamins, and oxidants. However, this intake should not be too much as dry fruits contains higher amount of sugars as compared to other forms of fruits due to process of dehydration,” according to one source. Several sources suggest that diabetics can benefit from the fiber in dates. Fiber may help stabilize blood sugar levels. (If you are prediabetic or diabetic, be sure to consult with a competent healthcare professional before including dates in your regular diet). The beauty of dates is that a little goes a long way. Because they are so sweet, you may find that just eating one or two is satisfying. Dates make a great replacement for refined, white sugar. You can buy date sugar. And there are ways you can use dates as a replacement for white sugar when you bake. Dates Have Major Significance in Different Cultures. Dates grow on trees called date palms and are native to the Middle East. They are often consumed during celebration feasts for the end of Ramadan, a month-long Muslim observance where fasting is practiced from sunrise to sunset. “Archeological evidence shows that the date fruit has been cultivated since 7000 BC in what is now Western Pakistan. Dates are also one of the seven holy foods/seeds of Judaism, along with barley, wheat, lentils, beans, garlic and onion,” reports one source. And even though we are past the American winter holiday season, we may want to perhaps keep those bowls and baskets of dates around throughout the year. This is because along with fiber, dates contain essential nutrients including selenium, copper, potassium and magnesium. Let’s explore further how dates may be beneficial to our health. Dates May Be Good for Cognitive Function. The NIH discusses a study in which mice were fed a diet that included dates and compared to mice that were on a non-date diet. The results revealed that the mice who were fed dates had less anxiety, better memory and better learning abilities. It is possible that these results are due to the fact that dates are rich in antioxidants and nutrients that may help prevent inflammation, one of the root causes of cognitive decline and many other types of disease. Dates May Help With Child Labor. A pregnancy is supposed to last 40 weeks, but it is not uncommon for a woman to deliver earlier or later than that time period. Once a pregnant woman passes 40 weeks, she is likely more than ready (to say the least) to deliver that baby. Furthermore, sometimes doctors need to induce labor in women who are past their due date in order to avoid complications. “Labour induction and augmentation with Prostaglandin and Oxytocin are well established as standard practice worldwide,” according to the Journal of Obstetrics and Gynaecology. This may make you question whether dates are safe to consume in early pregnancy. If you ‘Google’ this, you will find mixed reviews. But overall it appears that in moderation dates are a safe and healthy food for women in early pregnancy. Some sources even say the fiber in dates may provide relief from constipation, which is a common side effect during pregnancy. As always, consult your doctor about foods in your diet if you are pregnant or breastfeeding. Dates May Help Promote Fertility. Numerous studies or reports suggest that dates may address problems relating to fertility. Micro elements from date palm pollen extract (DPP) such as estrone, sterols, and other agents influence male fertility, according to the National Institutes of Health. 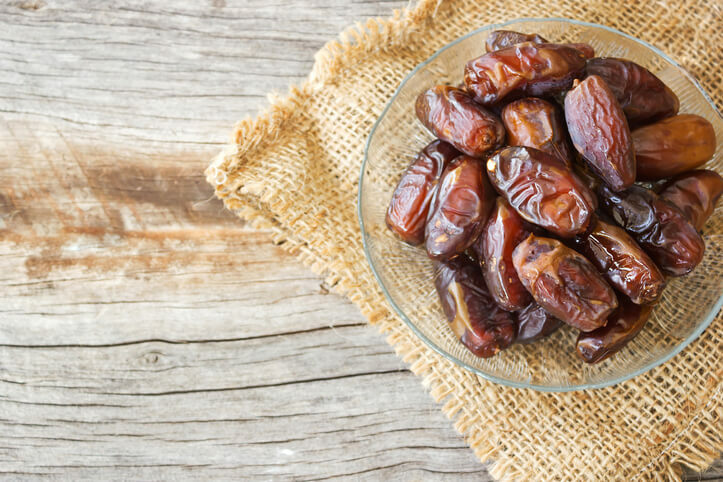 Dates May Help Keep Your Heart Healthy. Dates May Help With Bone Health. As mentioned, dates are a good source of the minerals selenium, manganese, copper and magnesium. Calcium is not the only nutrient that plays an important role in promoting and maintaining strong, healthy bones. The additional minerals mentioned are also key in bone health. For example, “Copper is involved in collagen maturation and this protein helps provide the ‘infrastructure’ that holds bone together.” If your intake of copper is less than the recommended daily allowance, this may lead to reduced bone formation. However, more studies are needed to fully confirm this assertion. (American Bone Health). Ways to Include Dates in Your Diet? The easiest way is to simply purchase dates at the store and eat them at your leisure in moderation. Be sure to buy dates that are not ‘candied’ or have added sugar. If you want to get more creative, you can chop up a date and throw over a spinach salad or some heart-healthy oatmeal. Or try these Celery, Date and Almond Butter Toasts. Dates also pair nicely with vegetables, giving that savory-sweet contrast. Check out this simple recipe of Oven-Roasted Brussels Sprouts with Medjool Dates. 1 (10-ounce) package shaved Brussels sprouts. (Do not have to use packaged Brussels sprouts, but may be more convenient). As always, consult a competent healthcare professional about what foods you are including in your diet, especially if you have any existing health issues or are taking any medication.